The Whacky Tower Play House combines all the fun of the Whacky Ranches fabulous bright design. With two great feature windows, the first a port hole window, that is perspec lined that is perfect for pulling faces out of and a more traditonal open square window that opens and closes, great for letting everyone know you are home! The Whacky Tower is raised up on a platform that allows you to use the space underneath as a dry storage area for toys or as an extra fun space for your child to play in. 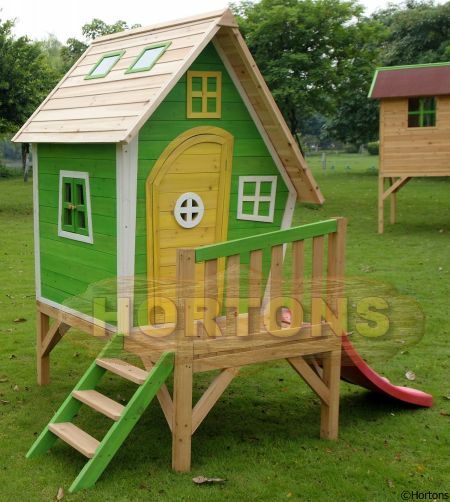 The great modern twisty bright design of this wooden Play house also offers access from a sturdy ladder and a strong safe green slide perfect for that quick get away.